DART has an important message for its customers, particularly during the month of January, which is National Slavery and Human Trafficking Prevention Month. That message is: See Something, Say Something™. Those words are on posters and decals prominently displayed inside buses and trains, and on facility maps at select stations. The safety of riders is a top priority for the agency. 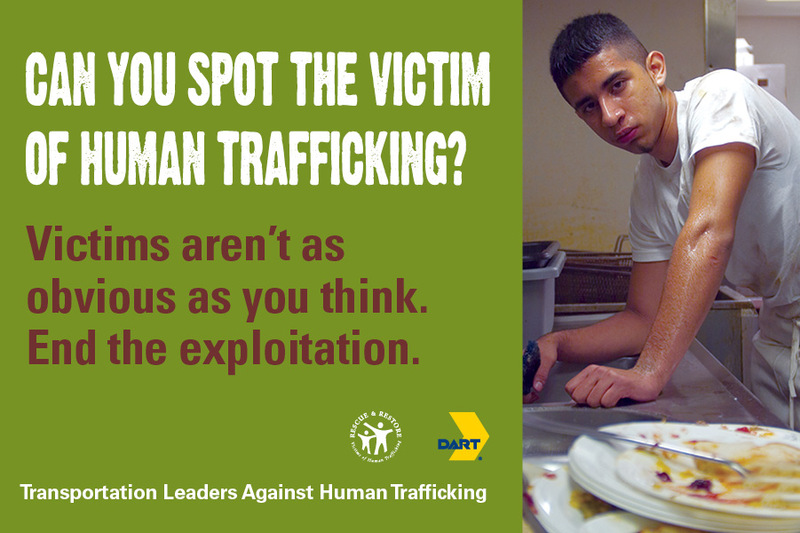 Several years ago, DART joined a national effort — Transportation Leaders Against Human Trafficking — to raise public awareness on how to recognize and report potential trafficking. It is estimated that more than 20 million men, women and children around the world are victims of human trafficking, with the United States as a source, transit and destination country. Maintaining a strong police presence on buses and trains, as well monitored security cameras at all rail stations, is one way DART is combating human trafficking and other crimes. Still, it is critically important for riders to be aware of their surroundings and remain vigilant to suspicious activities. If you spot something that just doesn’t seem right, contact DART Police at 214-928-6300 or call 911. You also can text 41411 and type DARTpolice at the beginning of your messages to communicate discretely with police dispatchers. See Something, Say Something is a national campaign licensed to the U.S. Department of Justice’s Nationwide Suspicious Activity Reporting Initiative. Its purpose is to raise public awareness and encourage consumers to report suspicious activity to state and local law enforcement. This entry was posted in Featured, Transit Tips and tagged Featured. Bookmark the permalink.